Hayes & Yeading’s home Bostik South Central campaign started off in fine fashion with a comfortable 4-0 victory of Egham Town at the SKYex on Saturday afternoon. The Manager made four changes to his starting line-up from the opening day draw at Cheshunt, Roddy Collins and Liam McDevitt came into the defence in place of Ryan Kinnane and Keano Robinson, Josh Chamberlain came into the midfield for Ola Olajubu who had a slight strain with Duncan Culley replacing Kaan Fehmi in the United forward line. 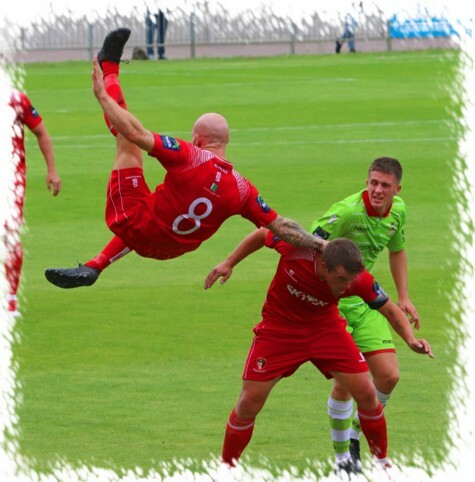 McDevitt on his United debut was forced into the action early doors as Tayshan Hayden-Smith fed the ball to Michael Kalu in the United box, his shot being well defended by the sliding United man in just the third minute. Two quick openings came and went for United. Toby Little’s deep cross from the left was chested under control beyond the last defender by McDevitt but his volleyed effort cleared former United ‘keeper Xavi Comas’s crossbar and then within a minute Lewis Toomey found space on the right of the Sarnies area, his low pull back set up a chance for strike partner Duncan Culley who saw his shot well blocked by Enock Soganile. Early chances were plentiful without troubling the scorers, Jermaine Osei broke away for the visitors and picked out Kalu on the edge of the box, his shot being blocked away by new arrival Roddy Collins midriff which left the defender somewhat winded as the danger was cleared. With less than a dozen minutes of the game played another chance was created for United, Tom Jelley hit a superb first time cross from the right, Culley neatly laid the ball off to skipper Scott Donnelly who saw his shot just clear the Sarnies goal. Comas saved from Donnelly on 21 minutes after a neat touch from Toomey before McDevitt found Little down the left, his first time centre was met by Culley who headed the ball downwards only for Comas to tip his effort over at full stretch as the ball took a sharp upwards bounce. 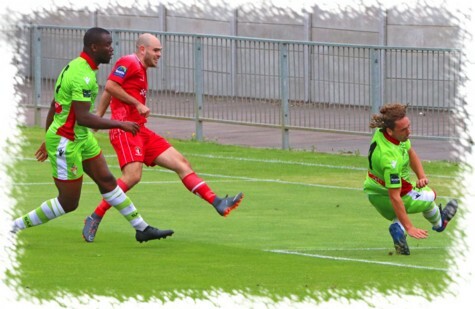 As the half hour mark approached, Toomey collected a ricochet in the Egham area and despite appearing to be shoved over, the ball ran nicely to Culley who was denied by the body of Soganile who blocked the shot away. A minute later United deservedly took the lead. Ed Asafu-Adjaye picking out Toomey on the left side of the box, the former Chesham striker gliding past former United defender Joe Debayo before firing across Comas into the far corner of the Sarnies net (above left). 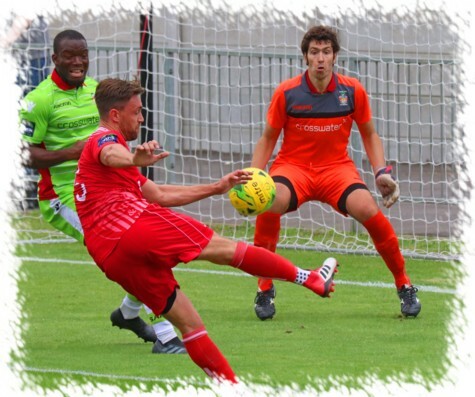 The visitors quickly put together another chance of their own, the ball falling to Georges Ehui who hit a fierce shot from all of 30 yards that James Shaw did well to palm away with the United back-line finishing the clearance. United almost replied in kind as a drive from similar distance form Josh Chamberlain whistled past Comas’s upright on 35 minutes. Just two minutes later though, United and Toomey had a second. Culley collected a perfectly flighted Jelley pass in the right channel and held off a weak Debayo challenge before looking up and picking out Toomey in the middle who did the rest by beating Comas to the ball to slide it home (photo aside). The half closed out with a chance apiece as Shaw held a long range effort from Josh Andrew and then immediately at the other end Jelley played the ball up to Toomey but with a hat-trick lurking, his effort was blocked away by Comas and the half ended with United two goals to the good. An enforced half-time change for United saw illness take Donnelly out of the game, his replacement being Ola Olajubu in the United midfield as Culley took over the captains armband. The first opening of the half did indeed fall to Culley who saw his header held by Comas and then just before the hour mark UNnited made it three as Scott Bridges laid the ball off to Toomey just outside the box and he drilled in a first time shot with the ball flying past Comas into the Sarnies net for the strikers first United hat-trick in just his second appearance. The other side of the hour mark Culley twice went close in a matter of minutes, his first effort going across the face of goal and agonisingly wide of the far post, the striker then flung himself onto a quickly taken Little free-kick only to see his diving header go an inch wide of the opposite post. Chamberlain then set up Toomey for another crack at goal, this one going just wide of the target while a rare foray forwards by the visitors in the second period saw a 20 yard free-kick from Soganile beat the United wall but go wide of the target without troubling Shaw. Another effort for the Sarnies with five minutes remaining saw Andrew cut in from the left and hit a 20 yard shot that while being on target didn’t really look like denying Shaw his first United clean sheet. 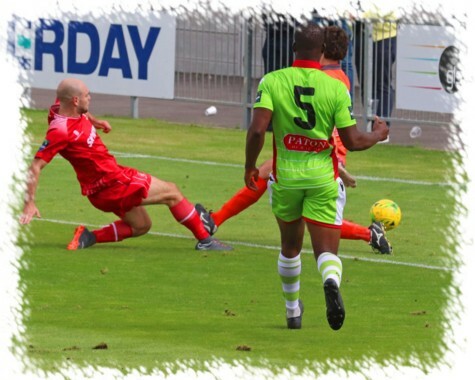 Two minutes later the game was rounded off with a fourth United goal as Culley’s persistence won the ball from Haydon 30 yards out, he was quickly back on his feet driving forwards before sliding the ball to substitute Lee Barney on the edge of the box, the former Beaconsfield striker hitting a fierce drive across Comas into the far side of the visitors net to seal a really good days work for Paul Hughes’ side. United Man of the Match: Lewis Toomey.